Carbides may occur in all iron-carbon alloys as a defect during solidification, depending on the chemical composition and wall thickness (cooling rate), regardless of the molding and the casting process. Carbide inclusions are characterized by poor machinability of the material and therefore increased tool wear. Moreover, carbide inclusions cause deterioration of the mechanical properties but, above all, the toughness properties of the material. 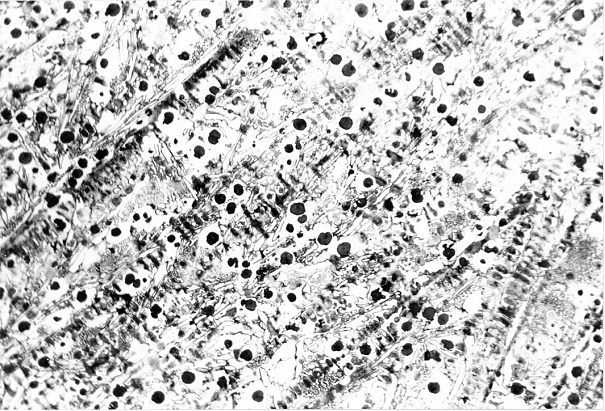 With metallographic examination, carbide inclusions generally become visible after etching (s. Etching). Carbides are metal-carbon compounds, for example cementite Fe3C (iron carbide), frequently available as double carbides (ternary compounds of carbon with two metals, e.g. Fe3W3C), as mixed carbide (here, through atoms of the alloy elements, e.g. (Cr, Fe)3C; (Fe, Mn)3C or (Cr, Fe)7C3) or as special carbides (eutectic and secondary mixed carbides of type M7C3). The most frequent forms of carbide formation in real castings are caused by chill, on the one hand, (Fig. 1) occurring in thin cross sections and referred to as chilled edges and by grain boundaries evolving in thick-walled areas due to slow cooling rates. A phenomenon is what is known as inverse chill. Depending on the nature and cause of carbides, they may occur as fibrous structures distributed across the entire cross section (edge hardness), as “gussets" in the last solidified melt (grain boundary carbide) (Fig. 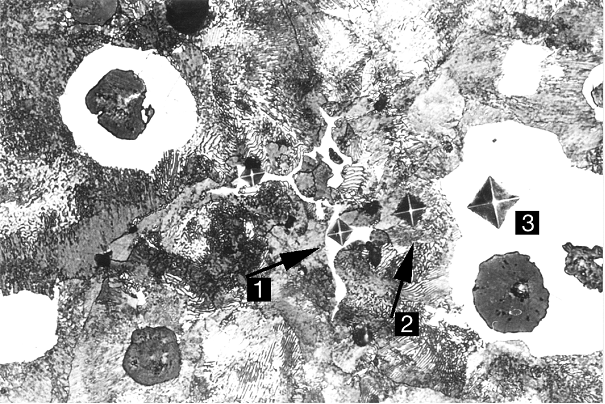 2), as “cube- or block-shaped” inclusions (titanium carbide) (Fig. 3) or even as “Chinese characters” (mixed carbides that are rich in molybdenum and vanadium) (Fig. 4). Not all carbides can be completely eliminated by means of heat treatment (annealing for carbide decomposition). For cast iron there are two types of solidification: eutectic reactions of the stable iron-graphite system and reactions of the meta-stable iron-iron carbide (cementite) system. 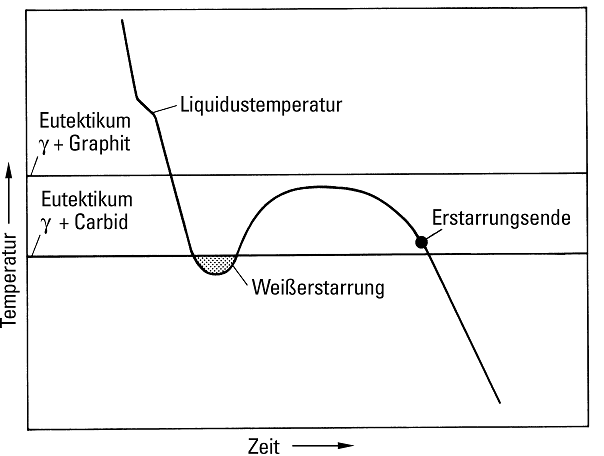 The eutectic temperature of the iron-graphite reaction is a lot higher than that of the iron-cementite reaction (Fig. 5). However, the problems that are associated with nucleation in the graphite phase are mostly caused by more or less severe cooling below the eutectic temperature of the stable system. With great cooling rates, the iron may cool down below the temperature of the meta-stable iron-cementite system so that the conditions are given for iron carbide (Fe3C) to develop; this particularly applies for thin cross sections and casting edges. If much heat is released during the eutectic reaction, the temperature of the residual melt may increase above the temperature of the meta-stable system again so that the carbide-forming eutectic reaction is stopped and therefore the depth of the chill is restricted. This type of iron material can then be left to completely solidify within the interval between the two eutectic temperatures as is illustrated by the hypothetic cooling curve in Fig. 6. 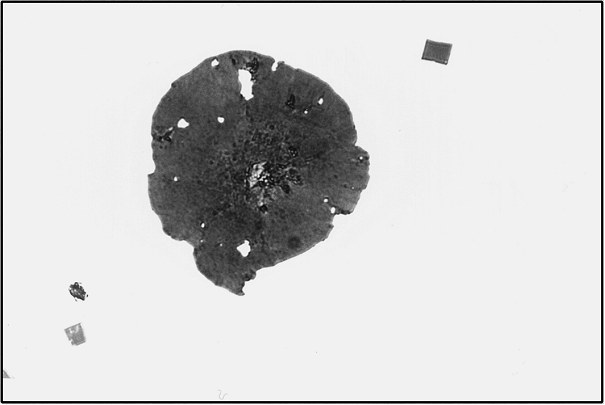 The result is a mottled white/gray solidified structure. 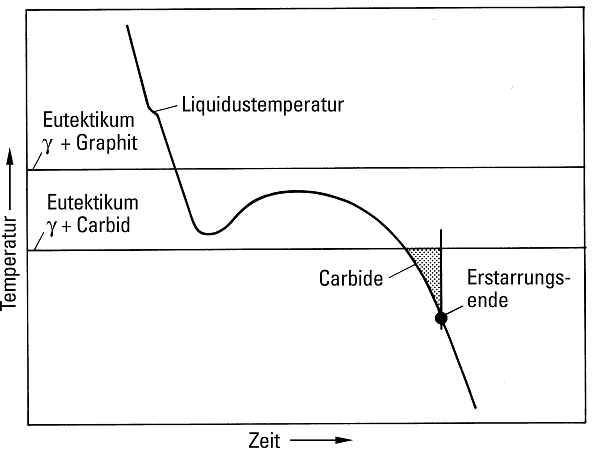 However, carbides do not only emerge during the first stage of the solidification process leading to chill, but also during later phases of the solidification process. As a general rule, the continuing eutecticsolidification releases enough heat to rise the temperature; however, towards the end, the speed of reaction is reduced and temperatures begin to fall. In case that the residual melt cools down to below the eutectic temperature of the meta-stable system, as is shown in Fig. 7, carbides may develop. These carbides naturally form along the boundaries of the previously grown eutectic grains and are thus referred to as grain boundary carbides. Accordingly it can be deduced that there are two occasion that cause formation of carbides during the solidification process: on the one hand, at the beginning of eutecticsolidification when cooling takes place at high rates, and on the other hand, towards the end of eutecticsolidification. While chill normally only occurs in thin cross sections and edge zones, formation of grain boundary carbides may also take place in thicker cross sections that cool more slowly. This particularly applied for castings made of alloyed cast iron. Alloy elements may substantially influence the chill tendency and carbide formation. The first phenomenon to be mentioned is that alloy elements cause a shift in the eutectic temperature of the stable iron-graphite system and therefore a induce a change in the carbon equivalent, which results in a direct influence of the chill. 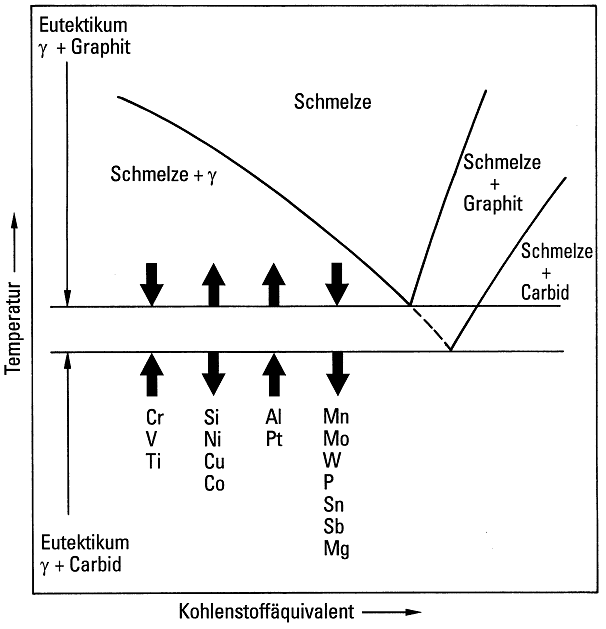 Moreover, the alloy elements change the equilibrium solidus temperatures for the iron-graphite eutectic (stable system) and for the iron-carbideeutectic (meta-stable system) as is shown in Fig. 8. Since the alloy elements have an influence on both eutectic temperatures, they practically affect the entire interval between these two eutectic temperatures and thus also the severity of cooling that is permitted for prevention of chill. With regard to chill, this alloy effect is equal or greater than that affecting the carbon equivalent. 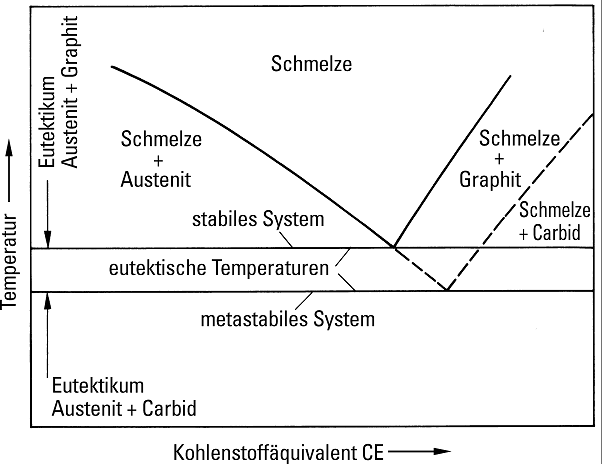 Graphitizing elements, such as silicon, copper, and nickel, rise the eutectic temperature of the stable system and simultaneously lower the temperature or the meta-stable system; i.e. they widen the interval between the two temperatures. Carbide formers, such as chromium, titanium, and vanadium, lower the temperature of the iron-graphite eutectic and simultaneously rise the temperature of the iron-carbideeutectic; i. e. they narrow the interval between the two temperatures. Some elements, for example manganese and molybdenum, lower both eutectic temperatures simultaneously and therefore should neither reduce nor increase the chill tendency of the material. However, for manganese the statement above is limited due to two reasons: Manganese causes reduction of the carbon equivalent and, what is equally important, has a degrading effect on the nucleation potential within the cast iron melt. Consequently, if the manganese contents are increased beyond normal rates, the nucleation state is impaired; i.e. the number of eutectic grains is reduced due to the interaction of manganese with sulfur during formation of manganese sulfide. In most cases, formation of grain boundary carbides results from segregation. Usually, graphitizing elements migrate towards the solid phase (austenite) and carbide formers towards the liquid phase (residual melt). Naturally, elements that only provide limited solubility in austenite, such as copper, phosphorous, tin, magnesium, or tellurium, may also be displaced towards the liquid phase. Since carbide formers, such as chromium and vanadium, accumulate in the liquid phase and accordingly, graphitizing elements, such as silicon and nickel deplete in the liquid phase more and more, the eutectic temperature of the iron-carbideeutectic in the residual melt is continually increased. At the same time, the temperature in the iron-graphite eutectic in the residual melt is lowered, since the melt is depleted of graphitizing elements as a result of segregation towards austenite. The consequence is a slow-down of solidification so that the solidification temperature is forced to drop, as is shown by Fig. 9. Addition of alloy elements, no matter if graphitizing elements (silicon or nickel) or carbide-forming elements (such as chromium) promote segregation and induce the conditions described above. In brief it can be concluded that high alloy contents increase the tendency for formation of grain boundary carbides. Understandably, addition of carbide formers, such as chromium, that both migrate towards the residual melt and increase the temperature of the iron-carbideeutectic hereby causes the most severe problems. 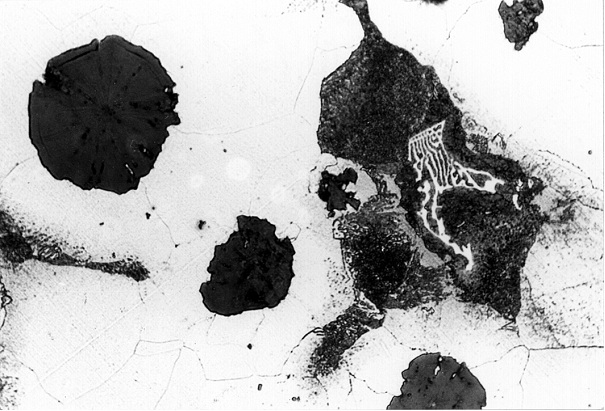 Concentration of such elements in the melt last solidified (almost) always results in carbide formation. 1. Select a nearly eutectic iron alloy composition, i.e. increase the proportion of graphitizing elements (e.g. Si, Ni) in the raw iron. 2. Decrease the amount of elements that increase the iron-carbideeutectic temperature (e.g. Cr, V, Ti but also Mn, and Mo). 3. Shorten the solidification ranges (high eutectic grain count, great number of eutectic cells) to ensure rapid eutecticsolidification and therefore reduce the extent of segregation. 4. Resulting from point 3., ensure optimum inoculation (if required primary and secondary inoculation) just before or during casting. 5. Generally keep the level of alloy elements rather low. 6. Avoid extended overheating periods in the furnace. This risk particularly occurs with high-power furnaces if they are not operated with furnace CPUs. 7. If required, reduce the steel scrap proportions in the steel and replace them by pig iron. 8. 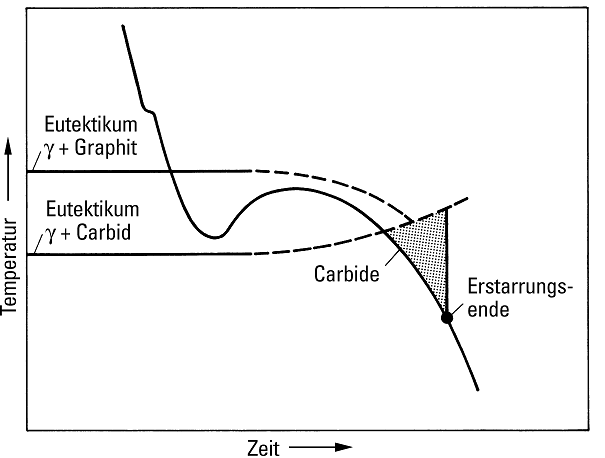 If carbide have occurred, it may help to perform annealing for carbide disintegration. However, this process does not cause all types of carbides (e.g. chromium carbides) to disintegrate.